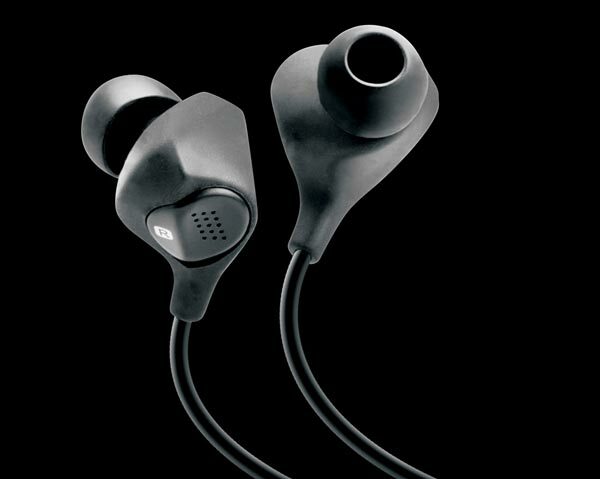 Snug active earphones that actually sound good with music – a rarity – but do have some real caveats, such as their incompatibility with anything other than the iPod. Noise-cancelling (NC) earphones or headphones are a marvelous invention: who doesn’t feel the need to shut out a racket at some point? I never travel anywhere without a set, but active NC earphones have to work extra hard to convince me of their worth, because I’m a freak you see. That way I get the best of both worlds – comfortable noise isolation without any electronics interfering with my beloved music. But like I said, I’m not normal, so I fully accept that just about everyone else doesn’t share either my fervour or my outlandishly rugged earholes. The real world alternative is a set of active NC phones, where clever electronics sample the ambient noise and generate the opposite signal, effectively cancelling out noise, to a degree. While they’re not much good against a screaming child, they’re fine with airplane engine noise, road rumble, train and bus racket, noisy air-conditioners and other background noise. However (and it’s a big however) – the same clever electronics mess about with the music. Some phones do it more than others, but in my experience, they all do it to some extent. It’s usually manifested as a rolled off and indistinct treble and sometimes the clarity of the midrange is affected as well. Still, anything is better than getting blasted with tiring noise, right? Yeah, I suppose so but if you love your music and can tolerate passive in-ear noise isolating phones, they’re the way to go. 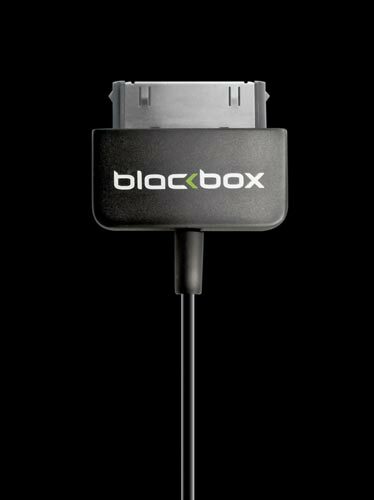 That lengthy introduction explains my skepticism at the recent Blackbox i10 earphone launch. A set of active NC phones probably weren’t going to float my boat, even though Blackbox has had some of the better NC phones. I kept my peace though, and ate my lunch before becoming acquainted with the i10s. The technology Blackbox has applied to these phones is quite cunning; active NC phones by their very nature need a power source for the electronics. On headphones, it’s a battery in the earcup, in earphones, it’s usually an AAA battery in a medallion on the cable. The i10s, on the other hand, draw their power directly from the iPod (and iPhone and iTouch – let’s just call them iPods) and that’s what makes them interesting. They use Apple’s 30 pin dock connector to get sound and power, instead of the 3.5mm earphone jack. Yes, there are some “buts”. 1.The phones drain the iPod’s battery 5-10% faster than normal. 2.You can’t charge the iPod or connect it to a computer using USB while the i10s are plugged in. 3.The iPod’s volume control no longer works because the level from the dock connector is fixed, so volume is controlled from a slider on the medallion. This is a little awkward to get used to seeing as you use the iPod to control track access but have to adjust the volume from around your neck. I heard comments that the i10s didn’t get loud enough, but they’re fine for my tastes. 4.You can’t use these phones with anything but an iPod. Maybe not an issue for most, but I use earphones with two other MP3 players, a mini-disc player, my computers, a bedside radio, CD players and occasionally a TV set. This means the i10s aren’t what you’d call versatile. 5.Turn the iPod off with the phones still on and you get a brisk “pop” as the electronics shut down. On the plus side, the i10s actually sound good. As in really good. Of all the active NC phones I’ve heard, they’re the least affected by the electronics. There’s the usual eerie sensation that the pressure in the ear canals has increased, but the actual music comes through clearly, with a clean and unveiled treble. There’s plenty of detail and real vigour as well. The overall balance definitely isn’t neutral though, rather it’s warm and rich, with exaggerated bass. 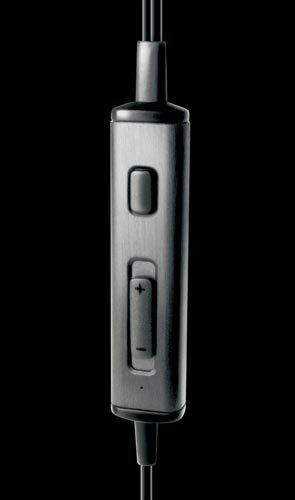 This isn’t a huge issue because it makes for a sound that suits portable audio but you will notice a big bottom end with bass heavy music. It might be worth a listen before buying. Noise isolation is impressive, especially once the music gets going, so they’re not the right phones for outdoor pursuits such as running. There’s a monitor button on the medallion, so you don’t have to remove the phones every time there’s an announcement or someone wants a word. You won’t want to remove them much because they are exceedingly comfortable; certainly amongst the best I’ve used. The soft earpads and the shape of the phones means they’re easy to insert, and they stay put. Perhaps a future version will have full iPod control from the cable medallion, not just volume control. Now that would be a cool feature. Long term durability may be a potential issue – the cable is lightweight and feels flimsy where it exits the dock connector. Also, the clip on the back of the medallion looks like an afterthought that won’t be around for long. I’ve been deliberately harsh with this set in an impromptu accelerated durability test, and all is well so far but only time will tell. They do come with a neat zippered carry case big enough to take the iPod as well, which should keep them out of harm’s way.